We called it a freeze, not a frappe. A milk shake was a real milk shake. Milk and syrup -- only. A milk shake with a scoop of ice cream mixed in was a freeze and a shake with a scoop of ice cream added afterwards was a float. Pretty much the same here in Dallas. I always thought Jersey Mike's was OK. I haven't been but, lots of people in Dallas rave about Jimmy John's. Supposed to be pretty good for a chain. Either way, I think Subway is the worst. Thank goodness we have Jimmy's Food Market. The link is on page two of this thread. Twinwillow I just perused Jimmy's menu and the pictures make me want to jump in the truck and drive up IH35 (which I hate) and go there. Let me know and I'll not only meet you there, I'll buy your lunch! PS, I feel the same about I-35. Good to know. Thankfully, as I mentioned before, we have Jimmy's Food Market in Dallas so Jimmy John's, Subway, and Jersey Mikes won't be seeing my smiling face anytime soon. While you could do much better, you could also do a lot worse. I posted about Jersey Mike's under 'Chains'. It has been a long time since I left Connecticut,but I used to like the H & M grinders in Windsor Locks near Bradley Field. Does anyone know if they moved into it and if so are the grinders still as good ? My first experience with a "grinder" was 20 years ago on a business trip to New London, CT. 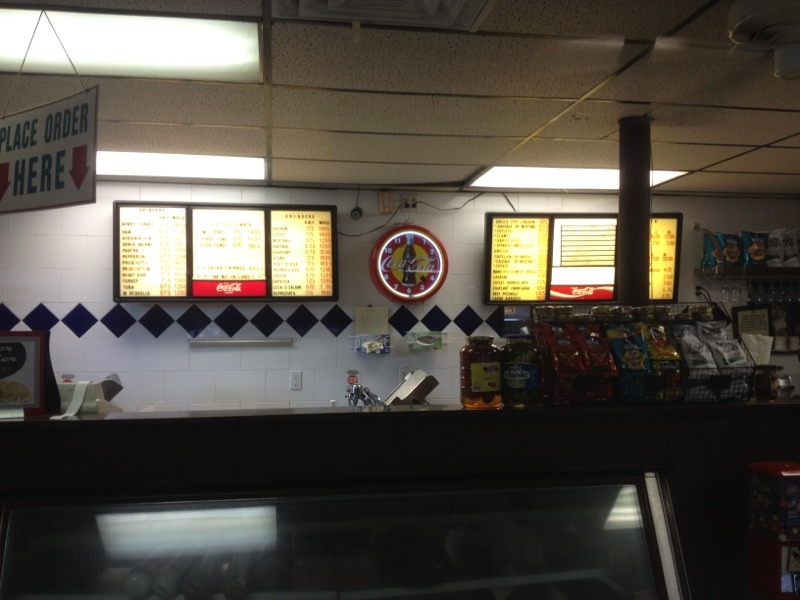 I wandered in to a sandwich shop just a block or two outside the Coast Guard Academy. 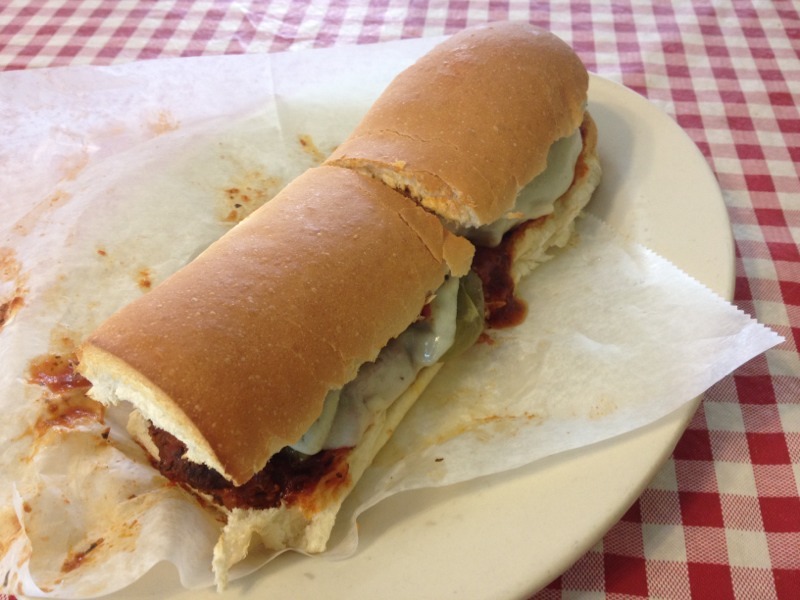 I had an Italian, just like the one shown by Ketteract in a previous post, with a birch beer. Being from the south , I had never heard the term grinder before. Before I posted this I went on Google Earth to see if I could locate the shop, but unable to do so. My contact at the CG Academy had recommend this place for lunch and I can't remember the name of it. Oh well, the grinder was pretty good! she was wondering if this was the place you were thinking of? I don't know whether that's where Davebassman was, but I had a memorable breakfast there once whole visiting Daughter No. 1 in Quaker Hill. Eggs scrambled with Italian sausage, peppers and onions. We may have to visit while we're in the area next week. 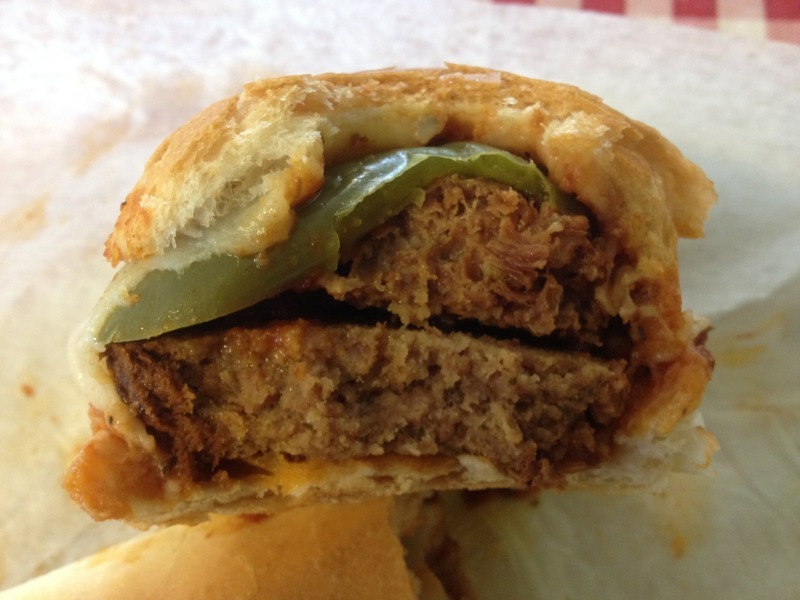 @brisketboy ~ Looks like WJ has sent you a few good suggestions for "subs" in Austin. I would also like recommend the subs at 360 Pizza. Two locations in Austin. Ask for Corey, the owner. He'll make you any sub you want as he stocks a large selection of great Italian salumi. Call first to see which location he's at that day. Subway is headquartered in Connecticut. When people go into a Subway there, do they ask for a 6” or 12” grinder? Years ago I used to like a New England chain called Papa Gino’s, which was headquartered in Massachusetts. 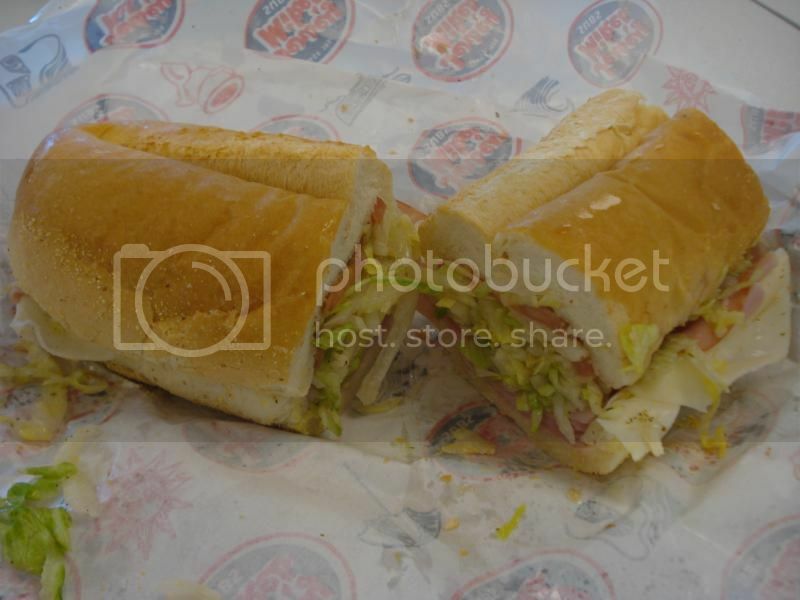 One time I went into one in Connecticut and asked for steak and cheese sub. They looked at me funny and said “you want a what?” Their menu on the wall said “sub” and I was tempted to point to it and show that their menu said sub. But I decided not to mess around with someone who was about to fix my food, so I just said a grinder. Looking at the Roadfood database for subs/grinders in Massachusetts and Connecticut, I see that they are barely mentioned. This is surprising since they are so popular locally. I know that most subs/grinders are bought in pizza joints there, but I would think that the Roadfood database would list some of the best places for subs/grinders in New England. Is this an oversight? I guess things have changed a lot in Connecticut if most subs are bought in pizza joints. I remember having to go into small grocery stores to get them made, and pizzerias didn't sell anything but pies.. 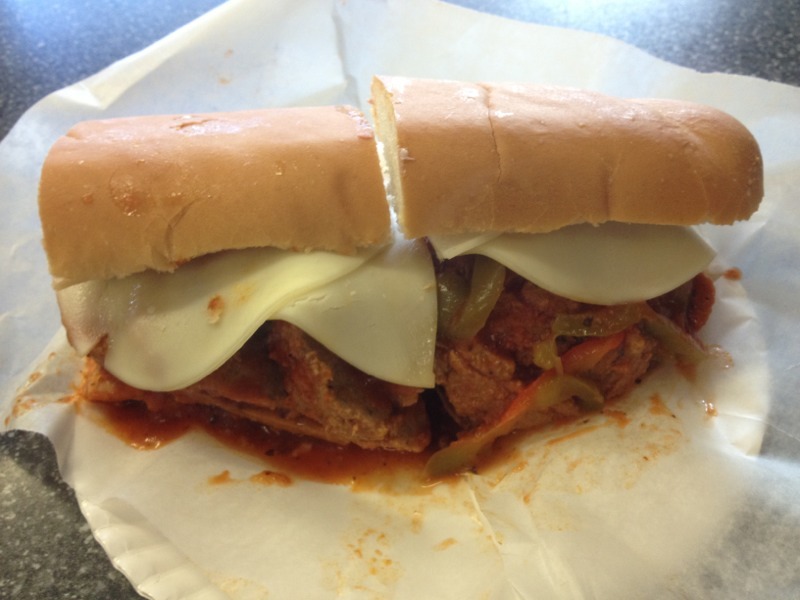 When I lived in Austin, Delaware Sub was a frequent stop for me, and these are authentic Delaware subs. Fantastic place. The founders of the company are from Delaware. But are they pizza joints that just happen to do grinders, or grinder joints that just happen to do pizza? Franklin Giant Grinder and Maple Giant Grinder, for example - both well-known and well-respected in the Hartford area - also offer pizza but I think anyone would say that grinders were their first specialty. I've also gotten good grinders from Zerio's in Cromwell, who also does pizza and calzones but used to be called Cromwell Giant Grinder. I'd suspect that many of the smaller grocery stores have faded away over the years - I did go into a Krauszer's recently, though, and have a world-class sandwich made for me. So there are some still keeping up the good fight. Not sure what other small stores I should try but I am open to suggestions! I think that could use some beefing up as well! Early dinner at Maple Giant Grinder today! Sausage and meatball combo - oof. I am definitely done for the day. Pleasant and welcoming. The staff is super duper friendly. No a/c, but they had both doors open and there was a nice warm breeze blowing through - it just added to the feel! 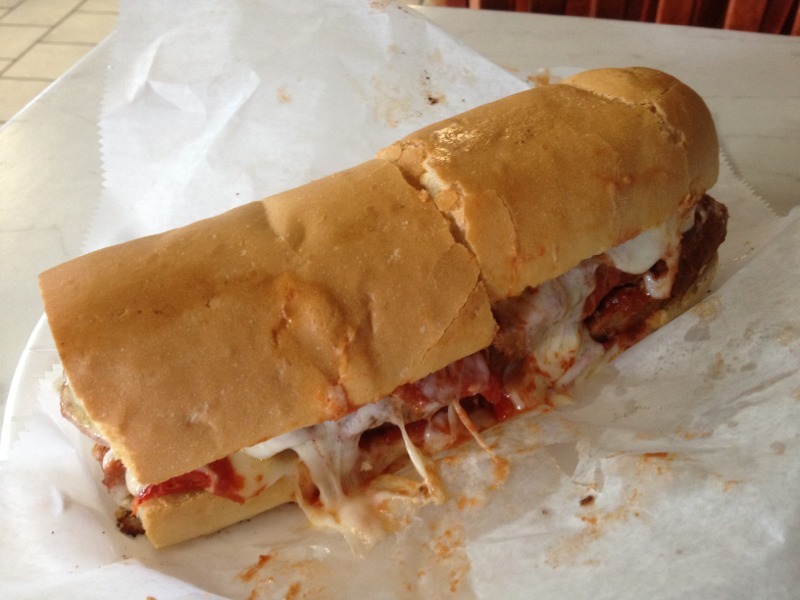 Gloriously thick layers of sausage and meatball. The different textures and seasonings work very well together. It was fantastic, and I told the clerk, who then communicated it to the elderly fellow in the back making the sandwiches. I almost opted for a slab of fried mozzarella, but restrained myself. I really can't say enough good things about the place. The friendliness of the staff goes such a long way. They helpfully directed me to the chips and beverages on either side of the counter, and asked me to withhold payment until I was done eating (first time I'd ever seen that at a grinder shop). Even the way the tables are laid out, in long unbroken rows, is an engaging community-type setting. Maple is somewhere you can sit and enjoy your sandwich and the environment; Franklin, not so much. Probably not. I checked out the Mr. G's website and they have a bar. The place I visited didn't have a bar. It was just a sandwich shop with a lot of basic stuff to buy, like 7-11/WAWA, etc., but on a smaller" local market" kind of scale. I have to be at work on Saturday 4:30am - 6:00am for a system upgrade, and I've decided to reward myself afterward with Franklin Giant Grinder as soon as they open. I thought it would be a good idea to compare their sausage-and-meatball combo with Maple's, so I will be sure to post pics! Oof. That was a rough morning. The manager in charge of scheduling the downtime decided to allocate a mere half-hour, under the assumption that everything would go perfectly. Unexpected issues ended up extending the downtime to nearly two hours. His credibility is in tatters but mine is okay, I think. Franklin's sandwiches are a little more expensive than Maple's, but when you get your order, you know where that extra money went. They're definitely bigger... but perhaps not superior. For me, the sausage and meatball one isn't, at least; both of the meats are very mildly seasoned, and I think a bit more distinctiveness is in order. Also, unlike Maple, they will not toast this particular sandwich. Well, I wanted to try what is apparently the third big player in Hartford grinders - Corner Grinder - but they were closed today. Maple, however, was open, so it was back to them, this time for a chicken parm. I forgot to ask them to toast it, but it was delicious nevertheless! I noticed the sauce more this time than before, wonderfully herby, and sweet, but not sweet like the cheap jarred stuff. If they sold it on its own, I would buy it. Was it basically chicken, cheese, and sauce? I'm not a veggie person so that's my kind of sandwich! Chicken cutlets, cheese, sauce, and peppers. The peppers are kind of hidden. I keep wondering if the several layers of thin cutlets is a style specific to this region. Every chicken parm I had before moving here was just one thick slab of breaded chicken. I think I prefer the layers, as they're easier to bite through. Since I live where you used to I'll corroborate...I've never seen a layered sandwich like that, either. Ketteract, that chicken parm looks fantastic!! I agree that several thin cutlets are better than one thicker one. 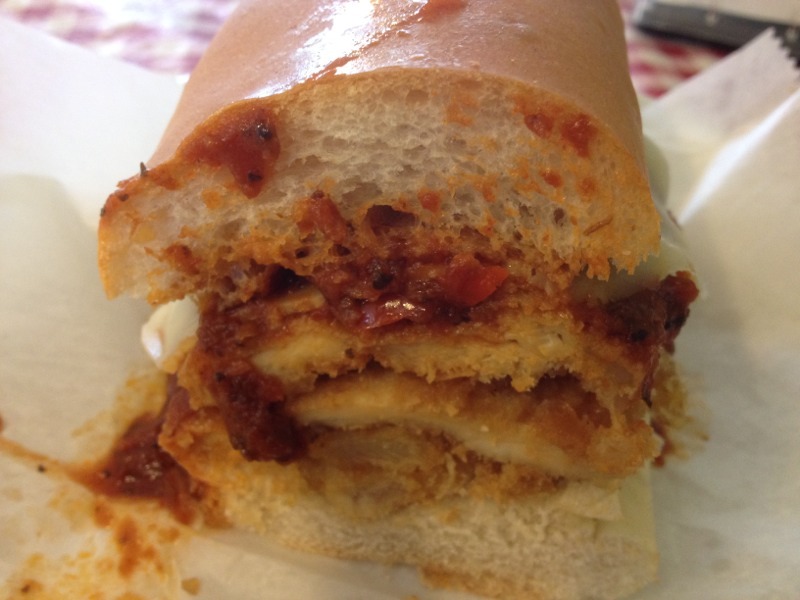 The all-time king of chicken cutlet grinders is, I hear, the Wethersfield Pizza House, such that their actual pizza is eclipsed. I'm going to try them out either this next weekend or the one after. 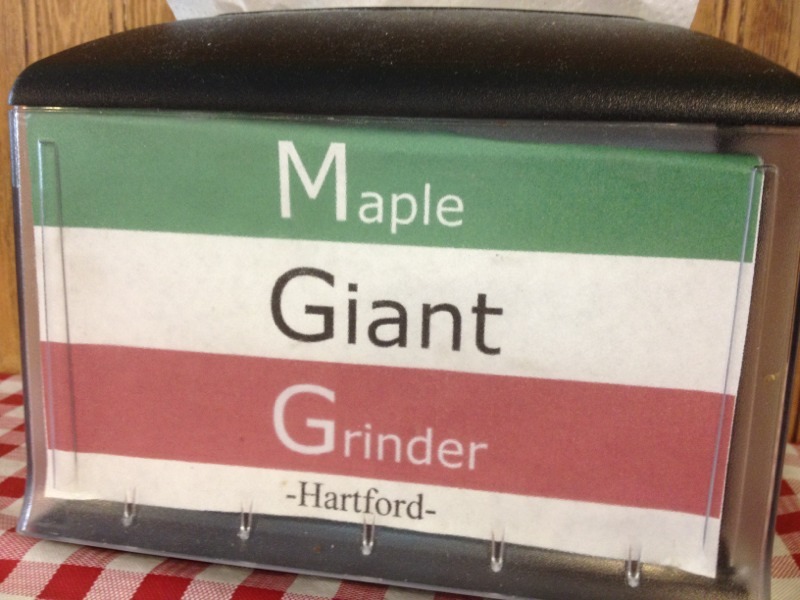 With my visit tonight to Corner Grinder, I have now completed my first grinder tour of Hartford, Connecticut (Franklin Giant Grinder, Maple Giant Grinder, Corner Grinder). It has the same old-school layout as at Franklin and Maple. Pizza by the slice: cheese, pepperoni, and the house special of spinach, potato, and sausage, which I will definitely try next time. 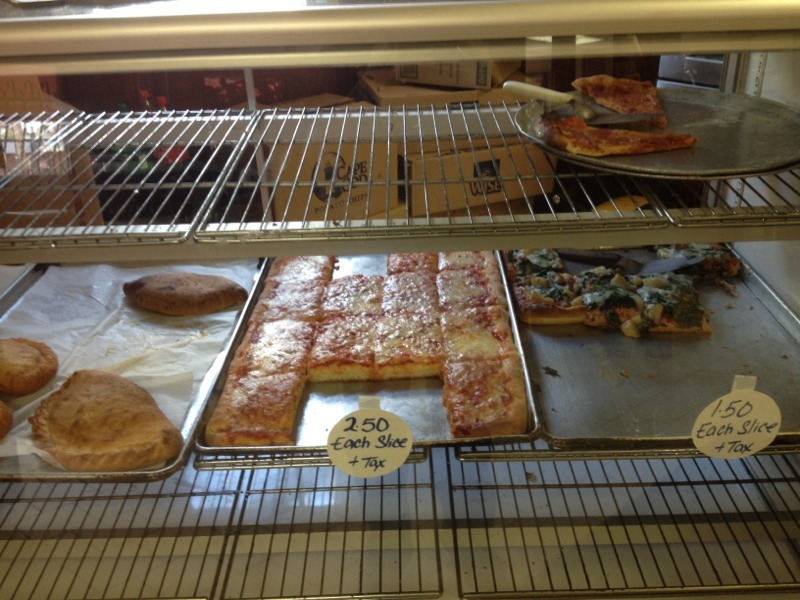 You can see calzones to the left, and, out of frame, other calzones that are twice as big as those. 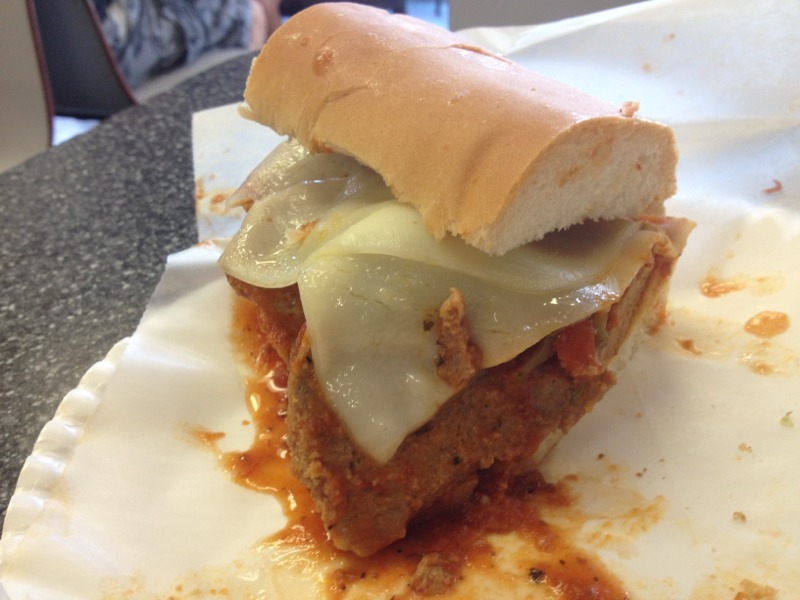 My point of comparison between the three shops has been the meatball-and-sausage combo, so that's what I got. And yes, they toasted it for me. Maple and Corner will toast whatever you like - Franklin is the only one with hard-and-fast restrictions on that. 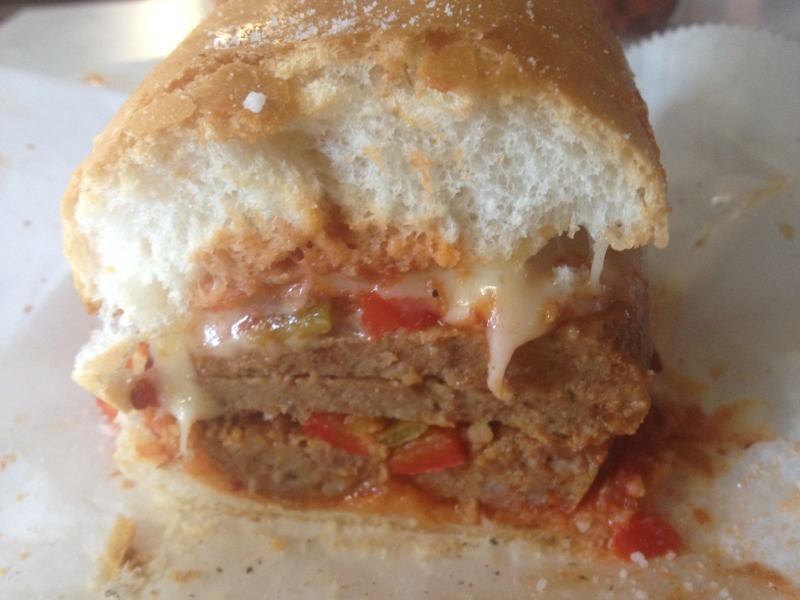 Sausage on bottom, meatball on top. Franklin did it this way as well, whereas Maple reversed them. Based on this particular sandwich, I give the tentative win to Maple for the most flavorful meats and sauce, as well as having an open, airy, inviting setting with very friendly staff. They do everything right. Corner takes second place, and Franklin third. 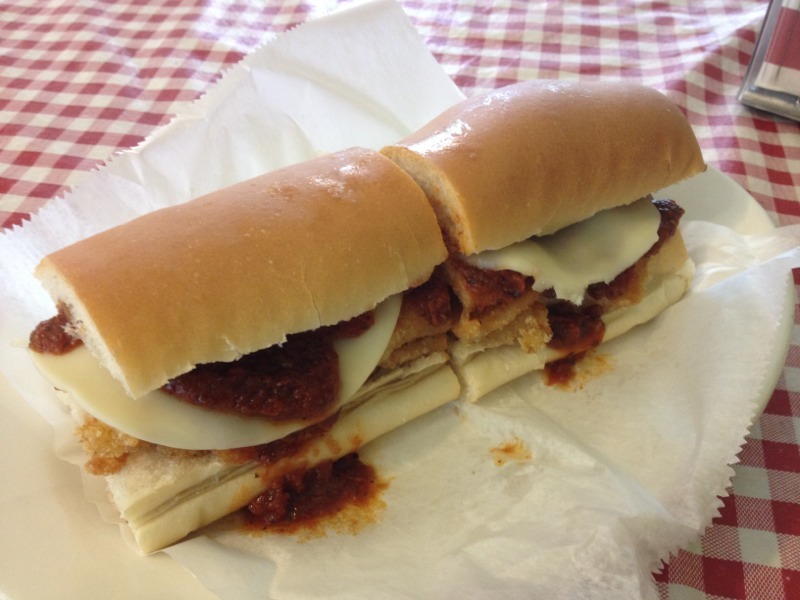 However, further comparisons with two other key sandwiches will be necessary for a complete evaluation: chicken cutlet and Italian combo (bunch of different Italian meats). 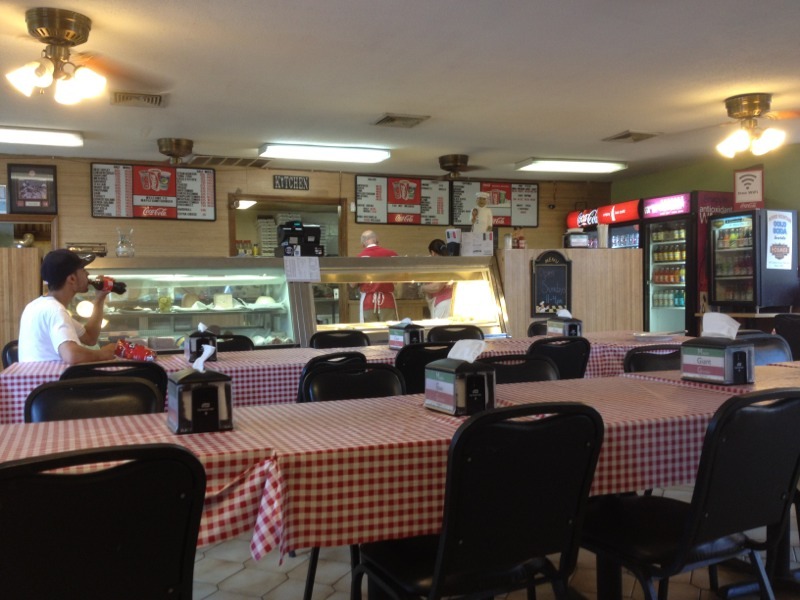 The Wethersfield Pizza House will be my next stop.